Trainer James Cummings says Interlocuter will need to go to “the next level’’ to win Saturday’s Group 2 $250,000 Villiers Stakes (1600m) at Royal Randwick but is quietly confident he can. Interlocuter has been arguably the most progressive horse in Sydney in 2017 with five wins and two seconds from his seven starts. Cummings said the Godolphin team has allowed the import to work his way to a race like the Villiers and if he’s good enough he’ll earn an exemption into the 2018 Doncaster Mile by making it four wins on the trot. “He’s raced through his grades quite rapidly but we haven’t been in any rush to drop him in the deep end before now,’’ Cummings said. Interlocuter has been favourite for the Villiers since markets opened with TAB on Monday. The five-year-old, ridden again by Tye Angland on 54.5kg, drew ideally in barrier four with stablemate Federal in six, Festival Stakes winner Testashadow jumps from eight while Mister Sea Wolf has gate 13. “Interlocuter is going to have to really get to the next level to be looking good against those horses,’’ Cummings said. “I feel he has had a good prep for the Villiers but it’s a really hard race to win and he finds himself in there down in the weights. “The horse couldn’t be going better in our eyes but it is a big step up to be competitive in a time-honoured Group 2 handicap. The last couple of Villiers winners have been Happy Clapper (2015) and Sense Of Occasion (2016) and both progressed to Doncaster placings the following season and, later, Group 1 wins. It’s been a month since Interlocuter’s last win, over 1900m at Rosehill where according to Punters Intel he ran 34.72 for his last 600m which was close to half a second faster than his opposition. He was a winner over the Randwick mile at his second run this preparation, back on October 7, and has been back to the trials to keep his fitness up for the grand final. “He pulled up great from Rosehill and he looks really well within himself,’’ Cummings said. “I’d be surprised if he wasn’t one of the standouts in the yard. “When I think back on his 1600m effort second-up it reads really well but he will need to be at his best. While all eyes are on Interlocuter, Cummings warned not to overlook stablemate Federal despite his run of outs stretching back to March 2016. Federal has been well supported in his last two starts and was beaten less than two lengths in the Festival Stakes behind Villiers rivals Testashadow and Mister Sea Wolf. “I feel like the horse is going well, he wasn’t beaten far and wasn’t suited by the downpour before the Festival,’’ he said. Chetwood is back in action in the Razor Sharp at Randwick. (Pic: bradleyphotos.com.au). Capable sprinter Chetwood makes his return from a spell having had a tie back operation since his shock ninth at Newcastle in March in the Listed $125,000 Razor Sharp Handicap (1200m). The five-year-old has won both his trials, the first at Canterbury by 12 lengths and the second at Warwick Farm by a head, and Cummings is hopeful the tie back has done the job though the outside barrier will be a hurdle. “Chetwood has been a great horse for the stable and has achieved a fair bit already,’’ he said. “He’s not going to find it easy where he is, carrying 59kg, but he’s training solidly and I was impressed by his trials. 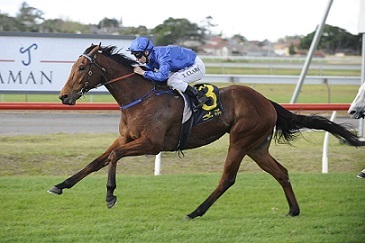 Meanwhile, another Godolphin two-year-old will make her debut at Canterbury on Friday night with Membrillo stepping out in the Tab.com.au Plate (1200m) to open the program. The last couple of Godolphin fillies to grace Canterbury, Gongs and Elessedil, came away with easy wins and while Cummings isn’t predicting a similar showing from Membrillo he said she has her share of talent. It’s an interesting juvenile event with Menari’s full sister Sweet Ava and Eawase, out of Karuta Queen, also enagaged. “I think my filly can be solid enough, the two trials are going to help her a long way at 1200m,” he said.